The increasing adoption of renewable power generation makes volatile quantities of electricity available, the delivery of which cannot be guaranteed, if sold. However, if not sold, the electricity might need to be curtailed, thus foregoing potential profits. In this paper we adapt service level agreements (SLAs) for the future smart electricity grid, where generation will primarily depend on volatile and istributed renewable power sources, and where buyers' ability to cope with uncertainty may vary significantly. We propose a contracting framework through SLAs to allocate uncertain power generation to buyers of varying preferences. These SLAs comprise quantity, reliability and price. We define a characterization of the value degradation of tolerant and critical buyers with regards to the uncertainty of electricity delivery (generalizing the Value of Lost Load, VoLL). We consider two mechanisms (sequential second-price auction and VCG) that allocate SLAs based on buyer bids. We further study the incentive compatibility of the proposed mechanisms, and show that both mechanisms ensure that no buyer has an incentive to misreport its valuation. We experimentally compare their performance and demonstrate that VCG dominates alternative allocations, while vastly improves the efficiency of the proposed system when compared to a baseline allocation considering only the VoLL. This article lays the ground work for distributed energy trading under uncertainty, thereby contributing an essential component to the future smart grid. Methenitis, G, Kaisers, M, & La Poutré, J.A. (2017). 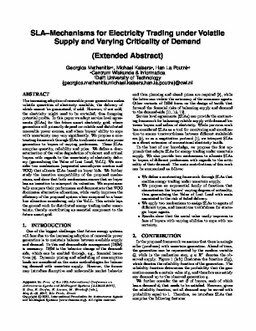 SLA-mechanisms for electricity trading under volatile supply and varying criticality of demand (Extended Abstract). In Proceedings of the International Joint Conference on Autonomous Agents and Multiagent Systems (pp. 1640–1642).